Does the devil wear Prada when cleaning toxic mold? We really don't know. While a fashion show may be the last thing on your mind when you're getting dirty cleaning up mold, you should be aware that clothing is important even under these circumstances. Of course looking good and matching your colors is a personal preference. What is important is that you protect your body while involved in clean up. Depending on how moldy the surroundings are, you may want to wear just enough or even a full wardrobe. Gloves are the most important item. 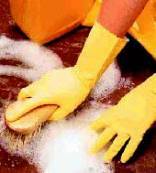 Touching mold or moldy items with just your bare hands is a health risk and should be avoided. Arguably worse, is working with detergent or bleach and using only your hands for the cleaning process. If any of these substances get in your eyes or are swallowed, you may have to call poison control. The most recommended gloves would be rubber and would be long enough to reach the middle of your forearm. If there's a possibility of getting mold or mold spores in your eyes, then definitely. The more advanced the mold growth is, the more likely you will have to cover your eyes. While wearing goggles without ventilation holes might seem silly at first, remember that mold spores travel everywhere and could cause serious eye irritation if you leave yourself unprotected. A Mask? Are You Kidding? You should avoid breathing in mold or mold spores and if you are standing or squatting in front of a mold infested area; then the more fatigued you become, the deeper you breathe in all of those nasty allergens. Many cautious people purchase a respirator, which can be found at any hardware store like The Home Depot or Lowe's. Some of these masks might be made of paper, while better ones will be made from plastic or rubber. These respirators must fit properly or else they won't be effective. While wearing a "mask" may seem overly dramatic, when the alternative is breathing in potentially toxic mold, it puts the situation in perspective. It doesn't matter who you wear or what color you choose when dressing for a mold-cleaning date. As long as you protect your hands, eyes and lungs, you'll be dressed for the occasion.